First a quick update. A few months back I moved to a new home here in Tucson. During the move I had to take down my meteor camera set-up. Though it took me longer than it should to find the time to set the cameras back up again, I finally did get around to it. BUT… all four of my cameras (the 3 PC164Cs and the single Watec 902H2) now have issues. One of the PC164Cs is completely dead (no signal, nasty electrical burning smell). The other three cameras produce a very noisy (and suspiciously similar) signal. I was hoping it was related to my cables/connectors but my all-sky Sentinel system works fine. Hopefully I won’t have to buy a new camera. In the meantime, my video meteor watching remains on hold. In the meantime I’ve been remotely observing a number of recently discovered novae. The most recent nova is Nova Ophiuchi 2012 No. 2 (originally designated as PNV J17395600-2447420). This nova was first spotted by John Seach of Chatsworth Island in New South Wales, Australia on May 19.484 UT at magnitude 10.5. Seach was hunting for novae with a DSLR camera and 50mm f/1.o lens. Spectroscopic observations reported on CBET 3124 classify the nova as a Fe II-type. I have been observing the Nova Oph 2012 No 2 remotely with the Sierra Stars 0.61-m on an almost nightly basis. After peaking around V magnitude 10.5, the nova has now faded to V ~ 13.4. In the red (R-band) it is nearly 2 magnitudes brighter. Part of the reason for the extreme red color is that the nova is located behind a dust-rich area of the galaxy. Dust can redden any starlight that passes through it. The difference between the nova’s brightness in the V and R bands also appears to be increasing. This is probably due to actual changes in the light of the nova rather than intervening dust. Nova Sagittarii 2012 (originally designated as PNV J17452791-2305213) was picked up by Russian astronomers, Stanislav Korotkiy and Kirill Sokolovsky, on Apr. 21.011 UT at magnitude 9.6. They used a 135-mm f/2 telephoto lens and ST-8300M CCD camera. In the over one month since maximum, the nova has faded from V ~ 8.9 to V ~ 14.5. While the two novae above are behaving like ‘normal’ nova with rapid and gradual fading, the first nova of 2012 to be found in Ophiuchus is acting much differently. Nova Ophiuchi 2012 No. 1 (originally PNV J17260708-2551454) was yet another John Seach find. He originally reported the nova on Mar. 23.39 UT at magnitude 9.2. Since that time the nova has widely varied in brightness from as bright as V ~ 10.5 to as faint as V ~ 12.5. Even over the course of hours V-band photometry shows brightness changes of many tenths of a magnitude. In case your wondering, the PNV J########-####### style designation is a preliminary designation given to suspected novae and supernovae by the Central Bureau of Astronomical Telegrams. The PNV stands for possible nova. PSN would mean possible supernova. The numbers after the J is the Right Ascension and Declination of the suspect. 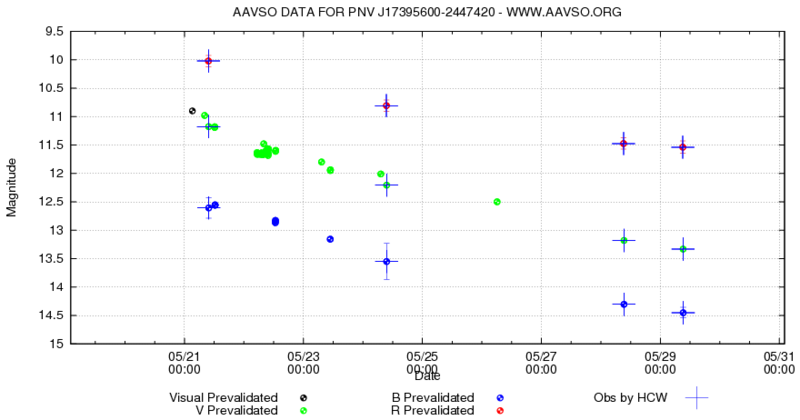 So PNV J17260708-2551454 means ‘a possible nova at Right Ascension of 17h 26m 07.08s and Declination of -25° 51’ 45.4″. 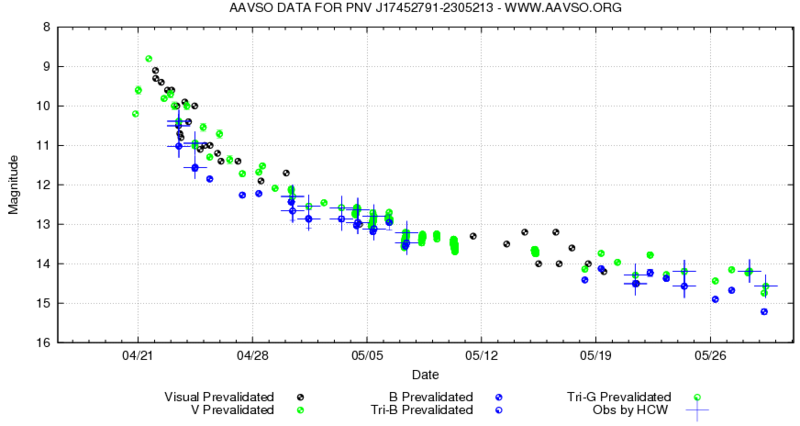 Lightcurves for all three novae were produced on the AAVSO website.